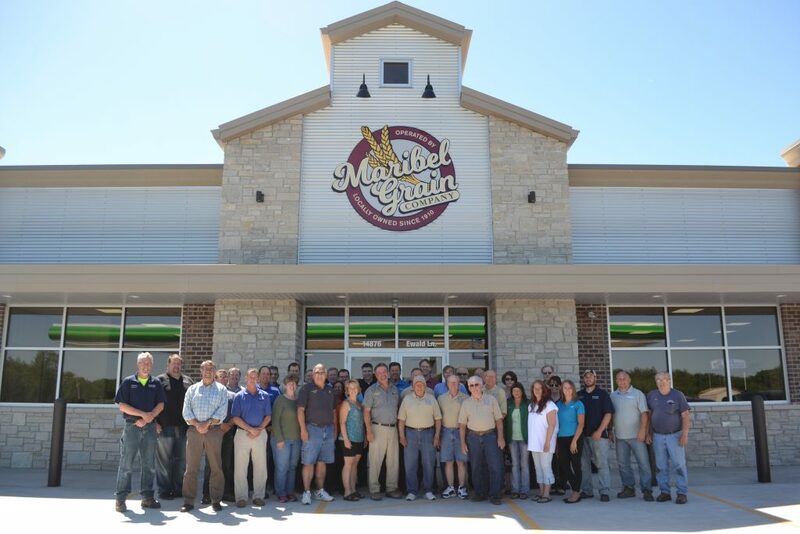 Maribel Grain Company continues 108-year tradition of moving Maribel forward. MARIBEL—Thick overcast and chilling rain greeted construction crews in January when they broke ground on Ewald Ln. in Maribel. 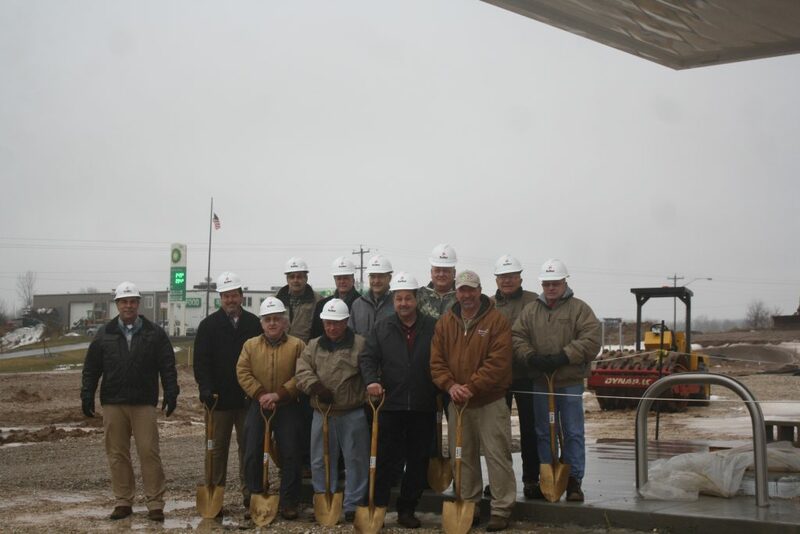 Maribel Grain, Denmark State Bank, Keller, U.S. Petroleum Equipment, and U.S. Oil representatives back in January when construction of the site picked up steam. 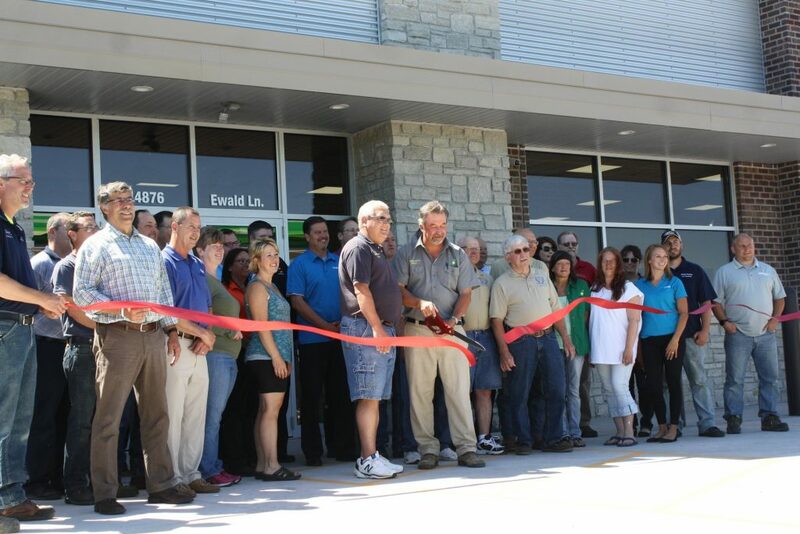 Some may have seen those conditions as a dark omen for Maribel Grain Company’s new gas station and Burger King restaurant, but clear skies and a blazing sun beamed brightly as the ceremonial ribbon was cut by the company’s general manager Brian Rabas and the wide array of contractors involved in the project on June 13. “Each one of you had a different role in this; each one of you was key in making this happen. I appreciate everyone—you all have your fingerprints on this,” Rabas told the group. One week after the ribbon was cut, the 7,500 square-foot development officially opened for business. It is the biggest piece of new construction in Maribel in three decades, bucking eight years of lost businesses and dwindling opinions. “We need to do something to change the attitude that Maribel is a dying community,” Rabas told Maribel Grain’s board of directors in 2015 after the village lost its branch of Denmark State Bank, a local mechanic shop, and had rejected two development proposals for the long-vacant The Ridge restaurant property. Heavy and excited traffic has greeted the new store in its first week of operation off Interstate 43 along CTH Z, though only time will tell if 2018 will be remembered as Maribel’s economic pivot. Of course, that is the hope, and the decisions which led up to last Wednesday were not made lightly. Through dedicated discussion and negotiation, the village of Maribel opened it’s first-ever tax-increment-financing (TIF) district to expedite infrastructure construction across 23 acres on both sides of CTH Z to the west of Interstate 43. Maribel Grain, with assistance from Denmark State Bank, is backing the TIF to avoid potential municipal shortfalls. So far, the TIF has funded sewer lines, storm water management infrastructure, and a new 600-foot street named Ewald Ln. in honor of the land’s past farmer Ewald Pantzlaff. The street and sewer lines could be doubled in size to accommodate new businesses on the remaining 15 acres. Rabas believes that the parcel’s vicinity to the Interstate and high traffic at the newly opened One Stop station will be a major attraction for mutually beneficial investments to come. There have not yet been serious offers to build around the area’s new economic keystone, but the state-of-the-art gas station and convenience store—with triple the floor space of I-43 One Stop’s old location—has already sparked new mutually beneficial growth. Advantage Transport, which hauls freight for construction and manufacturers as well as liquid gas, has been renting office and shop space in the existing gas station building for some time. Capped by the limited use in an otherwise booming sector, the company was considering relocating to meet its growing capabilities. “We don’t want to lose a business in Maribel, so we kept them there with the understanding that [I-43 One Stop] would move,” Rabas said of the fresh development’s early planning. Advantage purchased the building and will soon be renovating the interior and possibly beginning new construction. The 20-truck company will be continuing its role as I-43 One Stop’s fuel hauler, including the gas station’s addition of bulk diesel exhaust fluid (DEF) and off-road diesel fuels. Whereas Advantage is building on its current location, another trucking company is setting down new roots. Earlier this year, X-Treme Trucking purchased what was formerly The Ridge restaurant and is relocating its headquarters and about 20 office jobs there. About 40 to 50 trucks are expected to use the site as a central hub for trips across the contiguous United States and Canada, fueling from the newly installed pumps across the street. Due to X-Treme’s operational needs, a fiber optics line is being included within TIF spending, which will make high-speed Internet service available for new developments in the corridor. Remodeling of the building is still underway, but X-Treme is eying mid-July for the new hub to be operational. Long-range hopes of transformative business growth surely have excited the Maribel area, but the incoming Burger King location has largely captured the attention of salivating bystanders. The 2,500 square-foot restaurant with indoor seating and a drive-thru is being leased from Maribel Grain by Chicago-based Cave Enterprises, which operates more than 100 other locations in the Midwest. To bring the new vision to reality, several hands were brought on board by Kaukauna-based general contractor Keller. “All of you have your fingerprints on this.”–Brian Rabas. Most of the contracts awarded were to local companies (see caption above), and only slight complications—like a mid-April blizzard—kept the project from its targeted May 28 opening. After cutting the ribbon one week before opening day, he revamped the vision from metaphor to practical. “Hopefully it’s the start for more village development. We hope to develop this and put Maribel back on the map a little bit,” he said. Some may scoff at the implication that anywhere with a population under 400 had ever been on any map, but there are arguments to be made. When the Maribel Grain Company was founded in 1910 by five men and $7,500, it was during a time of rapid change and a burgeoning identity in northwest Manitowoc County. 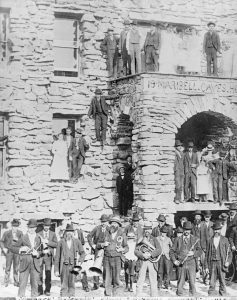 A massive celebration as Maribel Caves Hotel opened in 1900. In 1905, the Maribel Mineral Springs water company was established alongside an $80,000 hotel near today’s Maribel Cherney Caves. One year later, the first railroad service between Green Bay and Manitowoc was available, construction stations in Denmark and Maribel along the way. 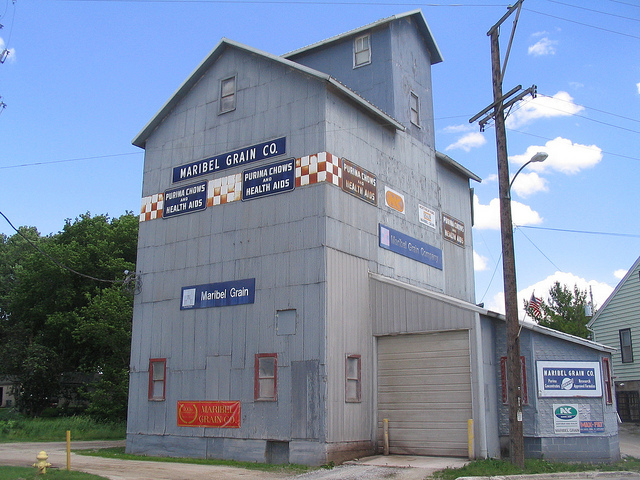 As a wave of locally-focused businesses sprouted up throughout the state in the early 1900’s, so did Maribel Grain Company, giving local farmers a path to market outside of national behemoths. 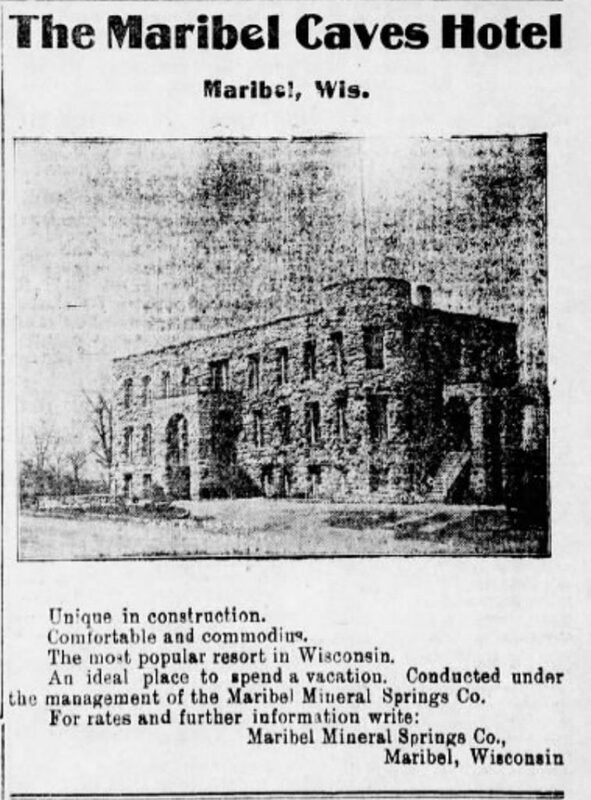 The hotel now lays in eye-grabbing ruins, and the Mineral Springs company fell short of its high aspirations, and the Maribel State Bank fell by the wayside, and the Maribel Lumber Company sits far in the rearview mirror. Yet more than a century later, the spirit of excitement has been reignited by that era’s lone survivor and the village’s most ardent supporter.